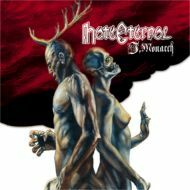 One of death metal's elite groups, HATE ETERNAL has returned with its third release, "I, Monarch". You'll read all the hype about this one topping both "Conquering the Throne" and "King of All Kings", and it's true. Retaining every ounce of the sound that frayed nerve endings the world over and still managing to "progress" with a slightly more groove-based approach, intelligible vocals, and a few surprise compositional twists, it's a no-brainer that "I, Monarch" is one of the year's best death metal releases. With the extraordinary Derek Roddy beating his kit into tiny little pieces and Erik Rutan firing off lethal riff volleys and twisting the production knobs, those enamored with previous works will find no reason to leave the fold with "I, Monarch". It's a shame that bassist Jared Anderson isn't along for the ride this time, but Randy Piro fills those big shoes with ease. The groove element surfaced to some extent on "King of All Kings", though it was still a matter of finding it amidst the ravaging arrangements. On "I, Monarch", the perfect balance has been struck. I better take a moment to assure the diehards that when I refer to "groove," it's not to be taken as an indication of a style change, only an enhancement to the signature sound. Songs like "Behold Judas", "The Victorious Reign", and "Path to the Eternal Gods" destroy as convincingly as anything heard on the previous two albums. The aforementioned surprises pop up on "To Know our Enemies", "Sons of Darkness", "Faceless One", and the title track. The use of a didjeridoo played on "To Know our Enemies" gives a creepy vibe to the arrangement, not so high in the mix as to be distracting, the addition is a welcome one. A kind of breakdown-esque slow riff pummel to end "It is our Will" is an effective reprieve from the brutality before the soul crush of "Sons of Darkness" begins. The latter track's ferocity is spiced up with a tribal tabla beat. On the title track, Tibetan human-bone instruments are utilized, which, according to the Earache press release, were "originally recorded by Austrian visionary Zero Kama." The final surprise comes by way of album-closer "Faceless One", an instrumental that features a kind of death metal-meets-tribal rhythm that includes riff chunks galore and Rutan's non-traditional winding solos. Roddy's extra percussive playing on the song is a joy to experience. I was pleased to see that Eric Hersemann has been added as second guitarist, an indispensable addition to the band, as the crunching blows of several rhythm guitar parts would be missed during the live performances. It will be the first time the band has performed live as a quartet. With that, I'll end by admonishing you to not miss HATE ETERNAL on tour; the added horsepower should make this round of touring the most devastating yet. I can't wait to hear the new material performed live.